You can teach a preschooler complex science skills in simple ways. Just engaging in observation and having a conversation about what you are seeing, creates stronger vocabulary and classification skills. 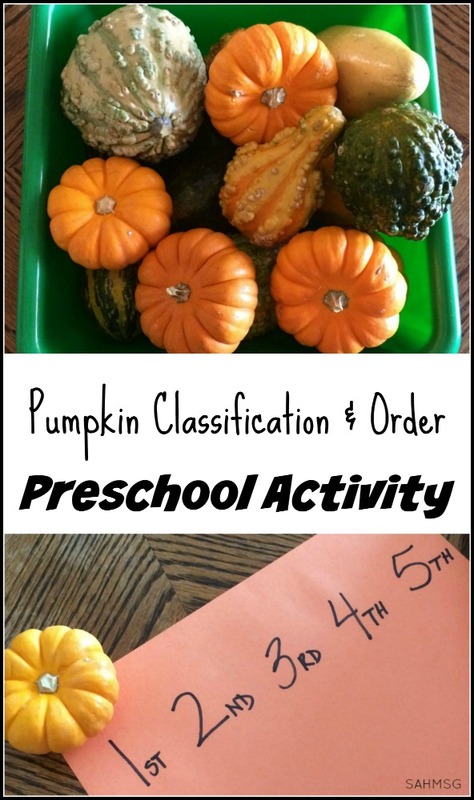 We tried out a Preschool activity that I call “Pumpkin Classification.” It is an observation activity that teaches organizational skills. 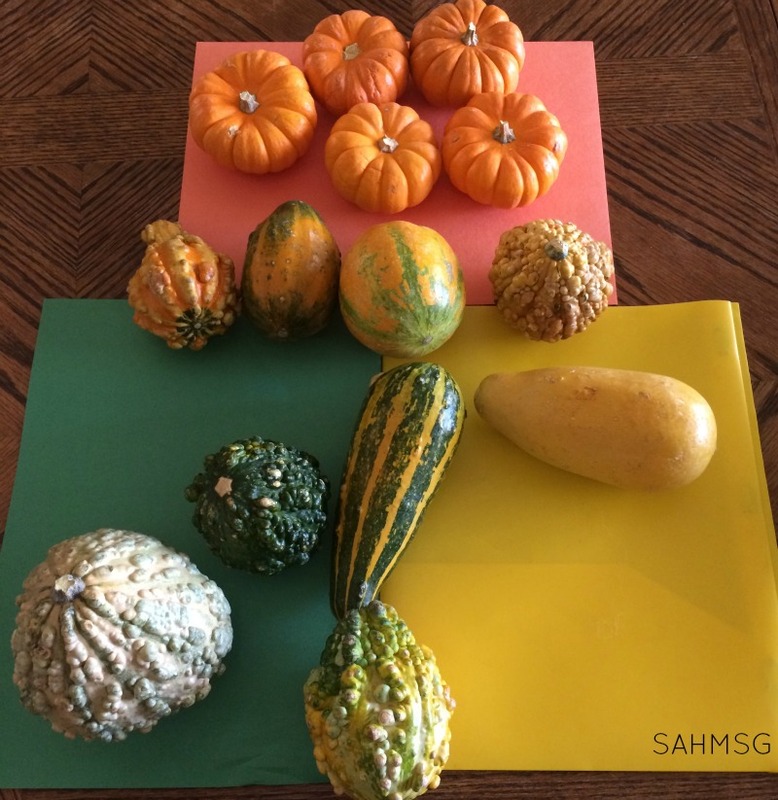 We use a variety of gourds and mini pumpkins to explore colors and blends of colors in order to group the gourds and pumpkins by how they are similar and different. I include a list of our favorite books about Fall, because we read a lot in this house and connecting our activities to books always enhances learning. Start by talking with your child about what you will be doing-looking at the pumpkins and gourds to see how they are the same or different. Set the pieces of construction paper on a table or the floor as shown. 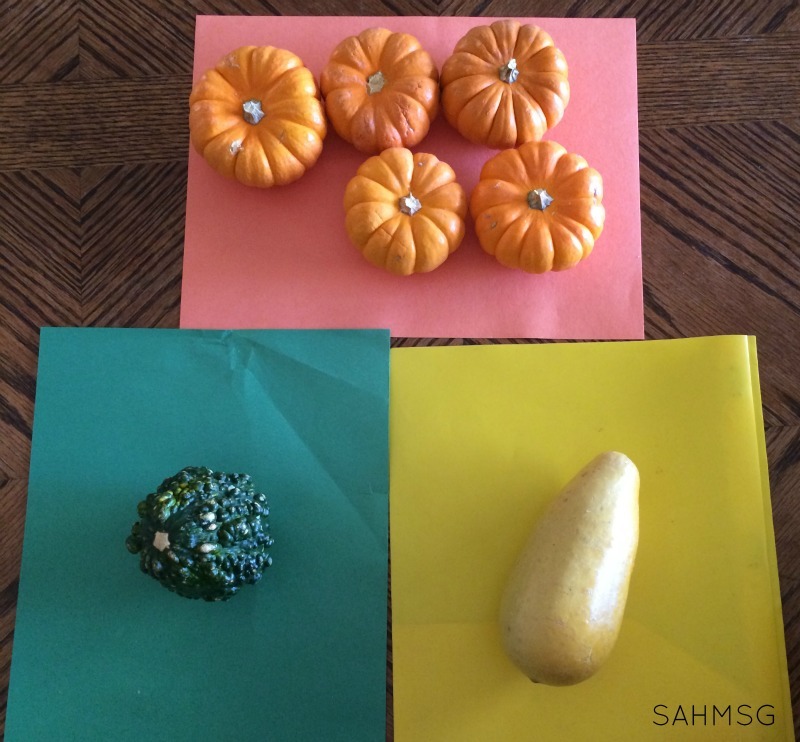 Ask your child to try to match the colors of the gourds and pumpkins to the papers. 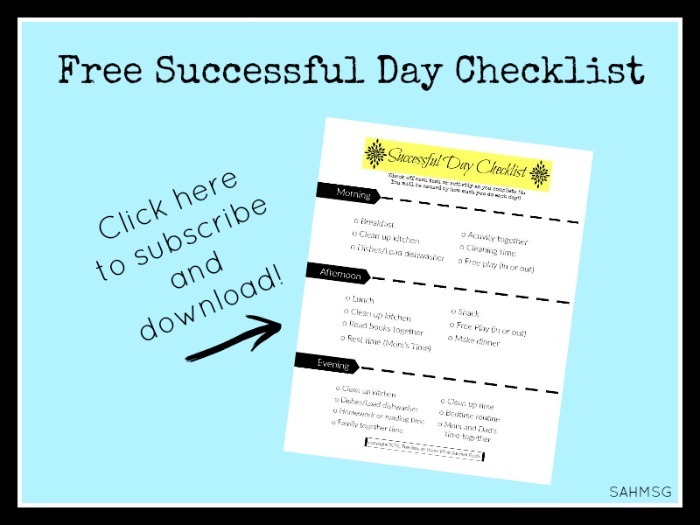 Your child can try this alone, and then you can step in to talk about what they did. Ask them why they put the yellow and green gourd where they did, or why they put the orange one where it is. Just have a conversation using descriptive words to talk about the process of classifying the pumpkins-otherwise known as organizing them by similar characteristics. At this point, I worked with my preschooler to look more closely at the gourds and pumpkins. I asked her pointing to a gourd, “What colors do you see on this one?” As she described that it was yellow and green, I suggested we put it where the yellow and green papers touch so we know it has both colors on it. This can sound like a really complex concept, but when preschool children are allowed to talk about what they see, it is pretty amazing how much language they use and learn to develop. 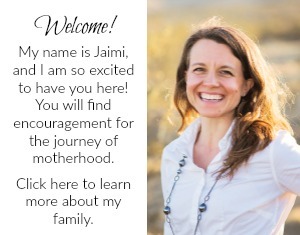 You are setting the foundation for a love of learning and helping to nurture your child’s interest in academic success just with little conversations and preschool activities. Nice work! 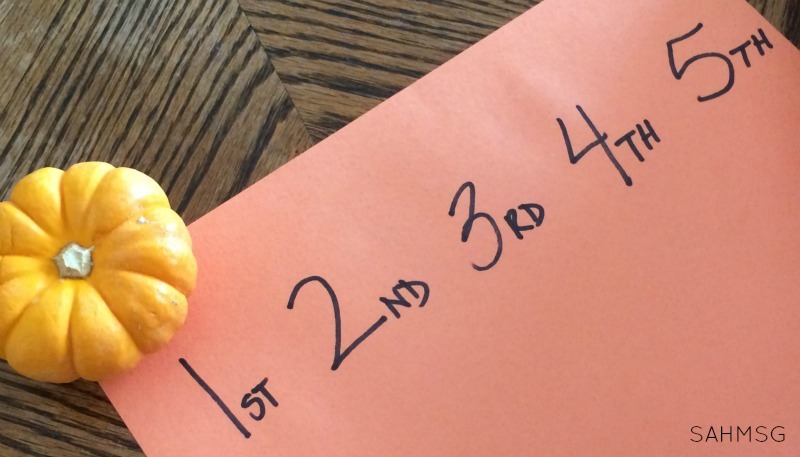 I took the piece of orange paper, and simply wrote 1st, 2nd, 3rd, 4th, and 5th on it in a row. The pumpkins were a little larger than the space, but a little overhang off the paper is ok. I pointed to each ordinal number abbreviation, saying what it was called, and asking my daughter to place the pumpkins from smallest to largest. We had talked about this before in our Pumpkin Puzzles activity. There was not that much difference in size between our mini pumpkins, so the task was challenging. She did it, though. When we complete our “lessons” or preschool activities for the morning, we always read books before lunch to wrap up and gather all of us together. The following images are links to the Amazon listings of our favorite books about Fall and pumpkins that are actually in our home library. A few I have even had since I was teaching! 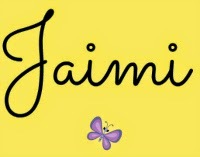 They are favorites and I know your children will love them too. You can click each image to view more details about each book. Most are $7-11 dollars each. 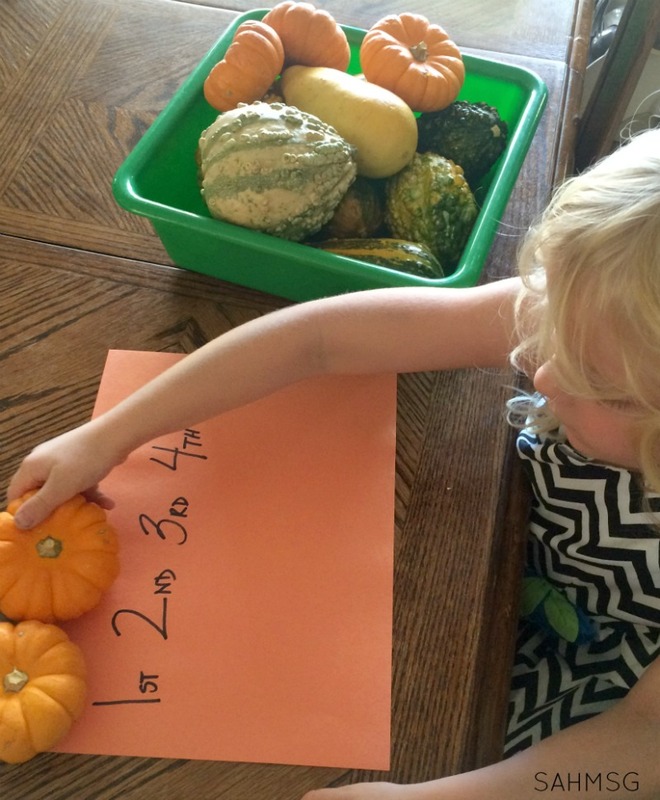 What has been your favorite way to explore pumpkins with your child this Fall?